﻿ First 4 Figures: Wolf Link and Midna Exclusive! First 4 Figures: Wolf Link and Midna Exclusive! 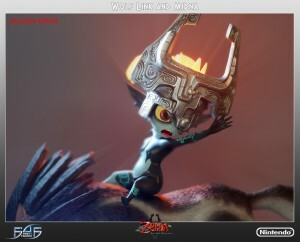 Home > First 4 Figures: Wolf Link and Midna Exclusive! The people behind the beautiful Zant statues, First 4 Figures, has gone far and beyond to create yet another statue. This time it is an exclusive Wolf Link and Midna statue that lights up if you have AA batteries. The price is set for $349.99.